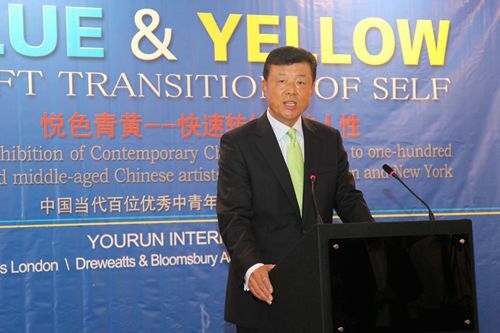 It is a real pleasure for me to join you today for the opening of this Blue & Yellow exhibition of contemporary Chinese art. I warmly congratulate the organisers and sponsors of this event. This is a wonderful opportunity for Chinese artists to have their works displayed in the UK, especially in the Mall Galleries. 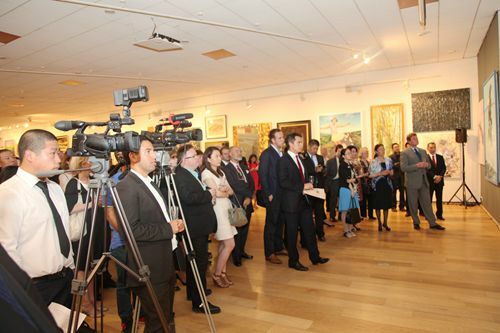 As we all know, the Mall Galleries is a leader in the UK championing new contemporary art. I am sure visitors will find this exhibition unique and rewarding in three aspects. First, it has a clear theme. Over the past three decades, since ‘reform and opening up’, Chinese society has undergone profound changes. Yet, the Chinese artists have never lost their interest in timeless aspects. These are the exploration through art of human feelings and a quest for self-expression and humanism. This exhibition presents a collection of 120 works from around 100 young Chinese artists. These artists represent a number of leading art academies in China. From these works visitors will have an intimate experience of contemporary China in all its social sectors. As you enjoy the exhibition you will see a riot of colours. It is not limited to ‘blue and yellow’! Also these young artists have graphically recorded the swift transition of their own lives. They are from a generation of Chinese that has experienced immense changes. This means that the exhibits are expressions of their thoughts and observations about a society changing at unprecedented speed. Second, this exhibition embodies the high level of contemporary Chinese art. Most of the works on display are oil on canvas. Oil painting originated in Europe. However, over recent centuries oil painting has taken deep root in China. In turn, different schools and styles of Western painting have left their mark on oil painting in China. At the same time, groups of Chinese oil painters have emerged with distinctive Chinese aesthetic approach and taste. In other words the styles of oil painting in China have evolved with distinct Chinese characteristics. Also, in recent years in China there has been the rise of some highly talented young Chinese artists. There is no doubt that they have systematic training in techniques. But what makes them different is they have drawn on the best of Western art while carrying on fine Chinese traditions. This exhibition before you reveals this fusion of Western and Eastern artistic inspiration. It is also the ancient and modern united. These combinations lead to the third aspect about this exhibition that I want to emphasize. Here around you is another success story of China-UK cooperation in creative industries. The exhibition is organised by Yourun International Art based in Britain, and supported by the Mall Galleries and Dreweatts and Bloomsbury Auctions. I was delighted to learn that this is not just a wonderful exhibition. In addition, there will be lectures and auctions. So this is a three-in-one event encompassing culture, academics and business back to back. This new model of cooperation is a commendable effort! · We watched the ballet production of Jane Eyre by Shanghai Ballet Company in London. · Beijing People’s Art Theatre staged The Tragedy of Coriolanus at the Edinburgh International Festival. · Now we are here opening this exhibition of contemporary Chinese art. · This exhibition joins a growing stream of artistic exchange between our two countries. · More importantly each of these cultural events is laying foundations to build many bridges of understanding and bonds of friendship between Chinese and British people. · For this I owe you all a big ‘thank you’! In conclusion, I wish this exhibition a great success! I hope the participating Chinese artists will create more fine works. I also hope that more young artists from our two countries will join hands in driving China-UK relations forward.